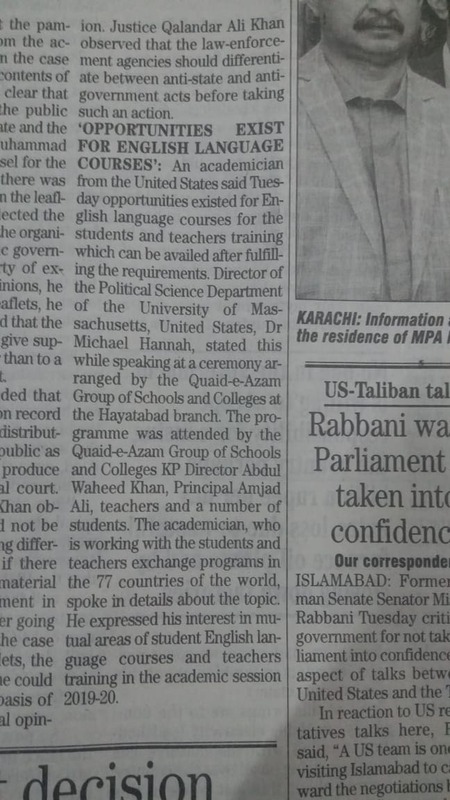 Mike Hannahan, director of the UMass Civic Insitiative spoke to the student body at the Quaid-e-Azam school in Peshawar, Pakistan. Dr. Hannahan was invited to speak by alum of the educational leadership program run by the Civic Initiative in Amherst in 2014, 2016 and 2018. Dr. Hannahan spoke about U.S. domestic policy and how it affects its foreign policies with Pakistan and nearby Afghanistan. He then took questions from students and faculty. Simliar article appeared in another Peshawar news outlet on the same date.